Finally, my last installment of the cards I'd delivered to the bridal shop, A Beautiful Touch, back in January. You can see my other Bridal Collections here: Part 1, Part 2 and Part 3. The shop owner told me there are many brides who have beach themes for their weddings. With that in mind, I created a card that could be given to a couple for their engagement or wedding, or just to the bride for the shower. You can see a peek of a seahorse stamped inside the card in the following photo. Stamps: seahorse - heart - Year Round Sentiments; sentiment - Best Wishes - Hero Arts Paper: Creamy Caramel, Whisper White - SU Ink: white - Ranger; Close to Cocoa - SU; Frayed Burlap - Ranger Fibers: twine - Creative Impressions; burlap ribbon; fabric medallion accent - Webster's Pages Accessories & Tools: Scallop Tag punch - Martha Stewart; Elegant Scrollwork die - Memory Box; starfish; white craft paint; glitter; rhinestones - Queen & Co. The owner also mentioned many brides LOVE their bling, so I kind of went all-out on this next one, which was very tricky to photograph. 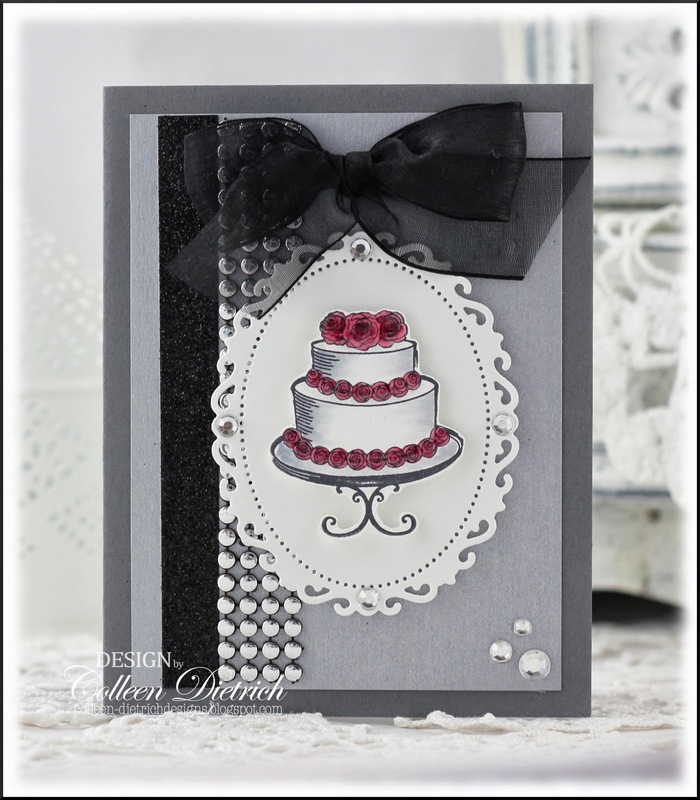 It's got a shimmery silver layer on a gray card base, a strip of metallic-looking studded ribbon trim from Webster's Pages, and glossy accents on the flowers of the cake. There's also a piece of black glitter cardstock, and rhinestones. And when you've got black AND white, the camera is very confused as to how to read the light. Sheesh! 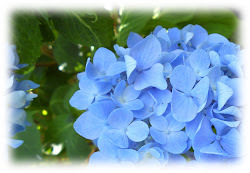 You can see the gloss on the flowers better in the photo below. I love the sweetness of this next one. 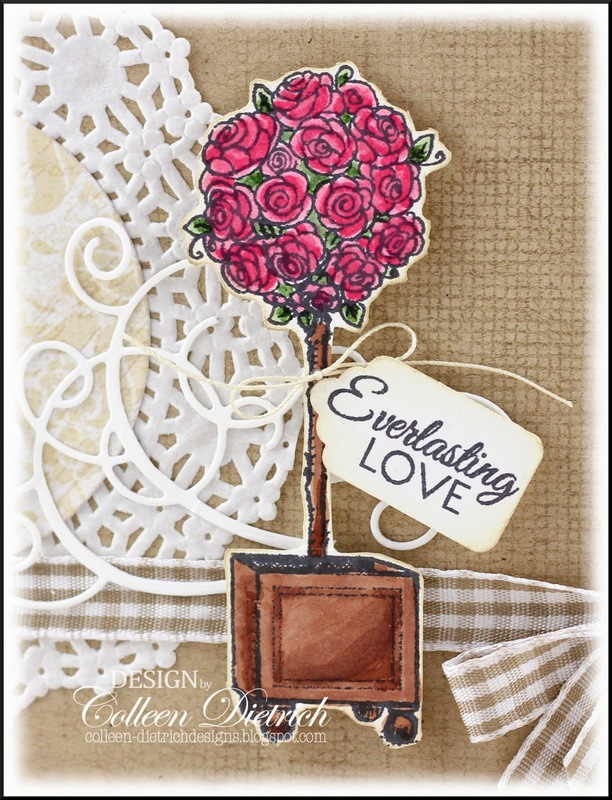 I created my own background with old Stampin' Up! 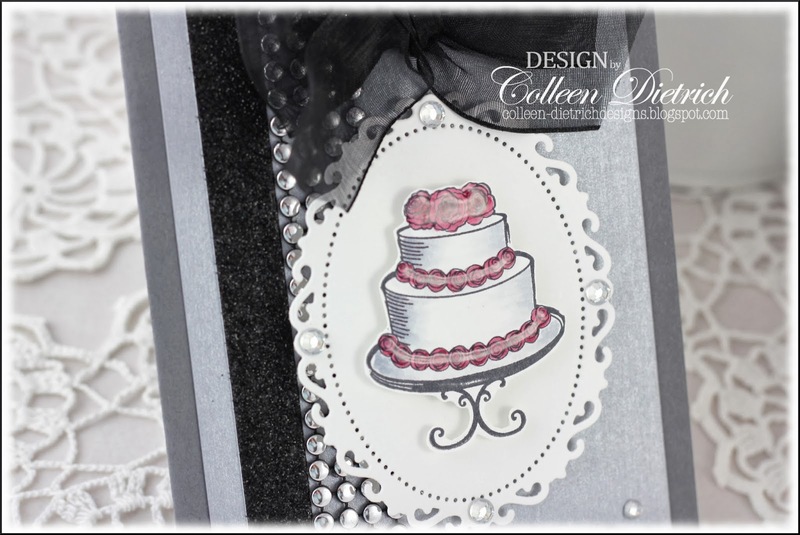 stamps: Canvas background, and a white flourish in the corner from Baroque Motifs. I love topiaries. This one - Flourishes / DIY Topiaries - was sitting in my UFO (unfinished object) box, colored and waiting to be used. I added a tag and sentiment from Verve. Stamps: Baroque Motifs, Canvas background - SU; DIY Topiaries - Flourishes; Love Story - Verve Paper: Crumb Cake, Whisper White - SU; floral pattern - Lost & Found/Madison Avenue - My Mind's Eye Ink: Memento Tuxedo Black - Tsukineko; Crumb Cake, Whisper White - SU Fibers: gingham ribbon - Really Reasonable Ribbon; vintage thread Accessories & Tools: doily - Wilton; Copic markers; Scallop Tag punch - Martha Stewart; Elegant Scrollwork die - Memory Box; pearls - Queen & Co.
Hope you enjoyed seeing the finale of the collection! WOW!!! Such WONDERFUL cards! LOOOOVE them all!!! ALL are GORGEOUS but the beach one caught my fancy! 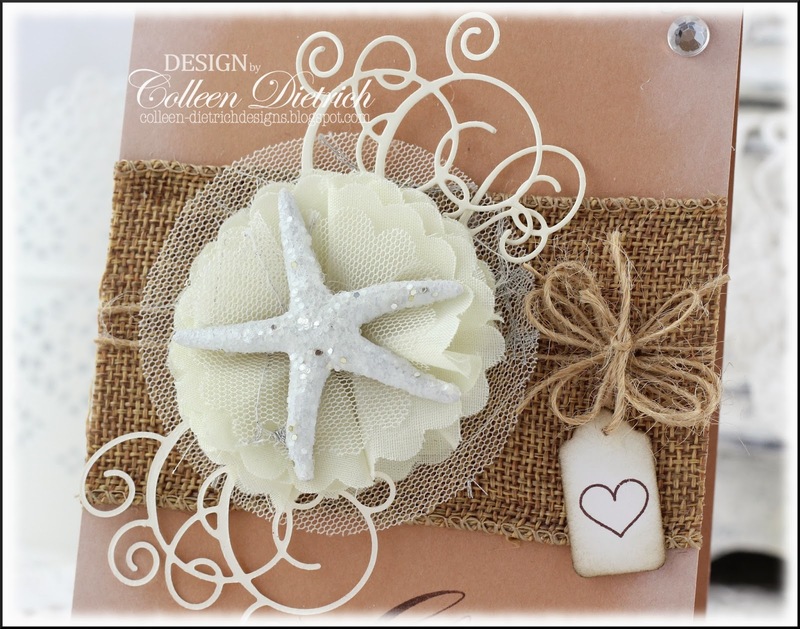 LOVE the burlap and the twine with the beach embellies! 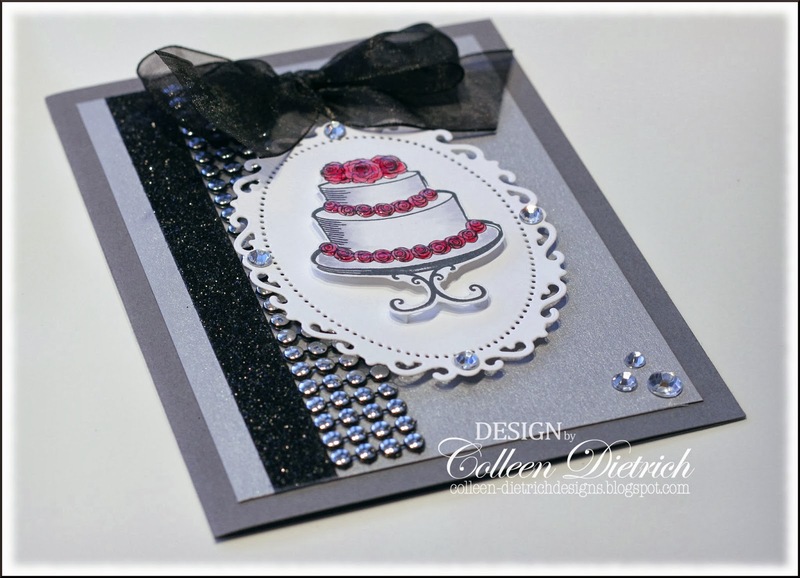 FAB cards, Colleen! Love the cards Colleen! The beach themed cards are amazing! !stunning cards..
Wow wow wow!! These are all gorgeous!! LOVING the beach themed one!!!!! 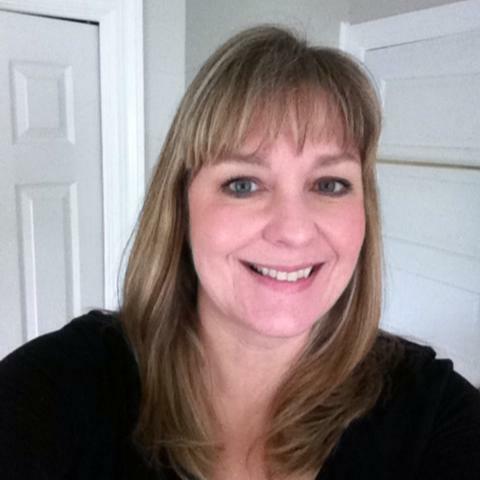 Love them all, Colleen! Especially the beach themed one. That first card is amazing!! Perfect for any beach wedding. Lovely job on the others. I agree with the others!! 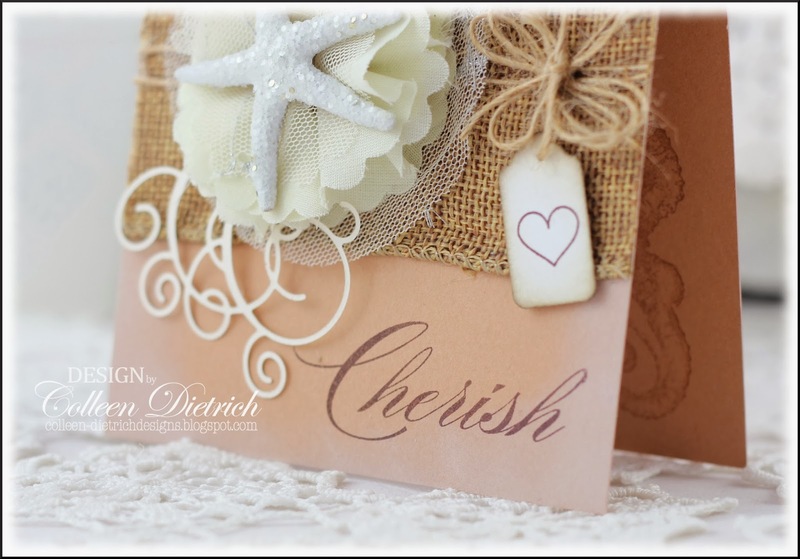 These are all beautiful but the layers and textures on your beach themed card are spot on!! The fabric medallion and starfish are gorgeous. Love the bling on the next one. They're all beautifully made. They are all gorgeous! My favorite is the one with the beautiful starfish! Beautiful cards ! I too loved the beach themed more :D ! Colleen, These are lovely and beyond. If they don't want them I do, but I have no money....I spend it on stamp paraphernalia!!! ;-) Kidding aside, these are spectacular and what memory keepers for whoever receives them. These are simply beautiful, Col! 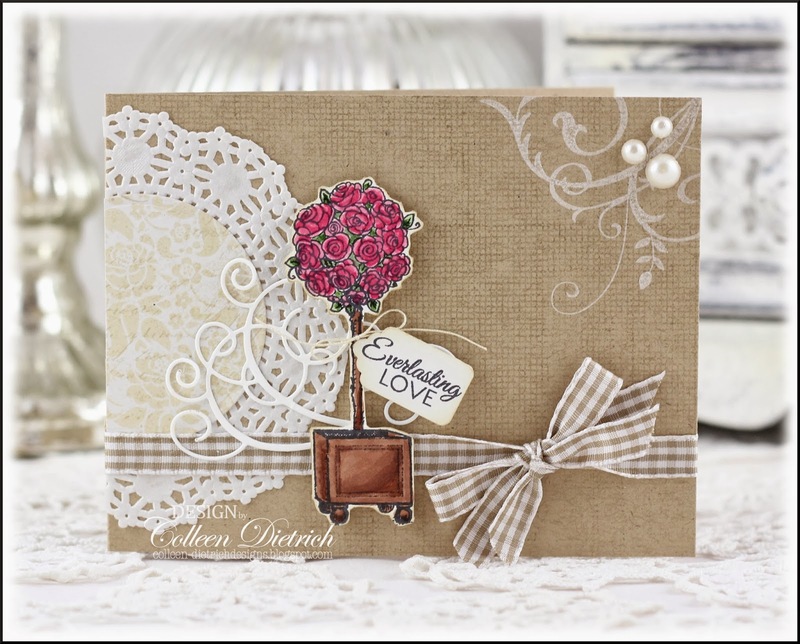 LOVE the stamping on kraft in particular, and all the amazing texture of your first beachy one is out of this world! Yum! Oh, I just love the beach themed card especially! Bet the shop owner never in her wildest dreams expected something so awesome. Plenty of bling for any bling lover on the second card, and the third would be so fitting for a wedding in a rose garden. Love the topiary set. 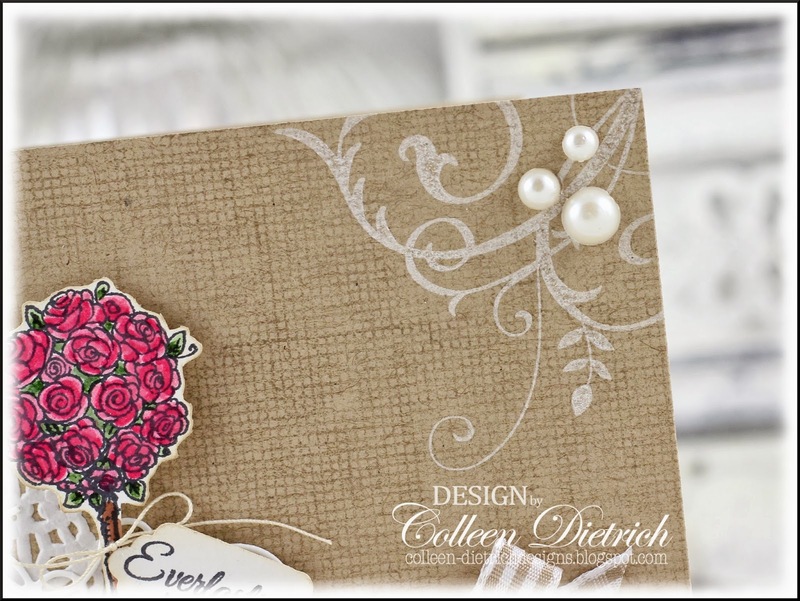 You rocked these wedding cards, Colleen! So many beautiful cards, wonderful details. 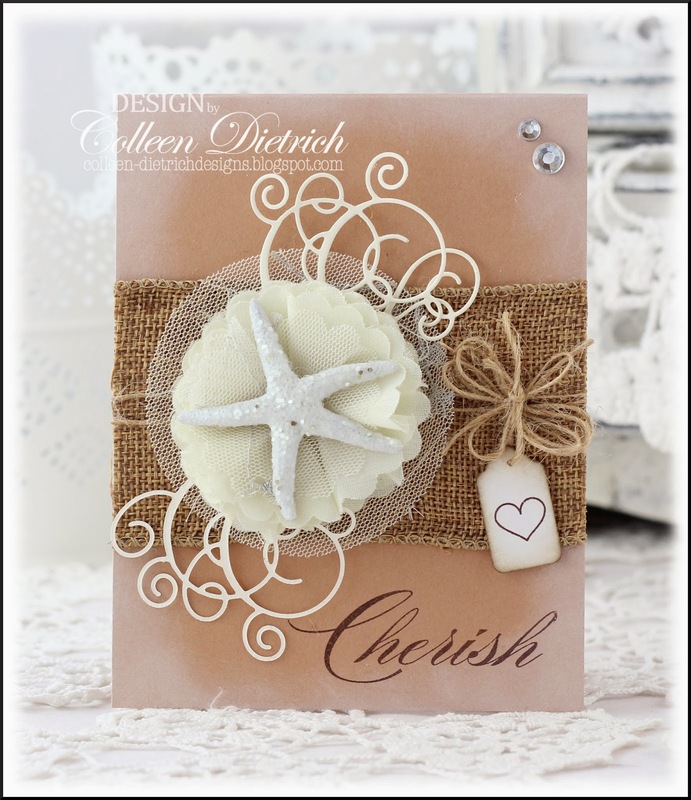 I love the starfish card, such lovely textures and gorgeous colours. These are amazing, I am loving the seashell and the great card designs.